Get rid of that awful soap scum buildup in your bathroom with this super easy 4 ingredient homemade soap scum remover! Okay, let’s just get this out of the way up front–cleaning the bathroom is never fun. However, in my experience, it’s even more not fun when you’re wrestling with a buildup of filmy soap scum. With regular store-bought cleaners, I’m on my knees for what feels like nothing less than an eternity scrubbing away… and there’s still soap scum! I just knew there had to be a better way, and I was right: Homemade soap scum remover with essential oils! 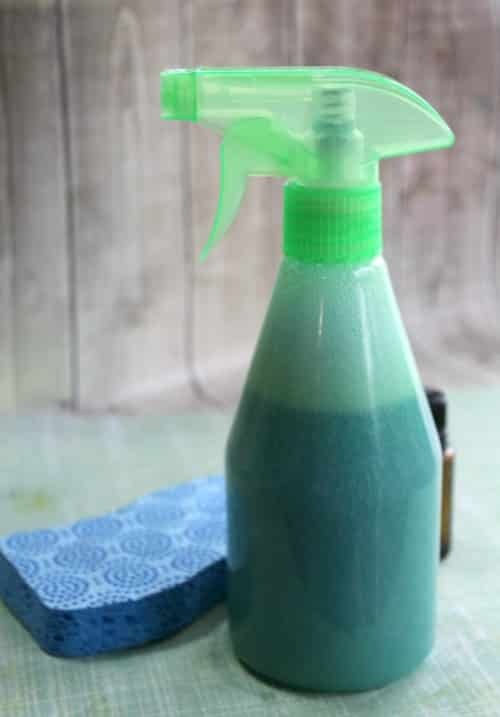 This homemade soap scum remover uses regular old dish soap, vinegar, and two powerful essential oils, tea tree and lemon, to send soap scum down the drain. The lemon essential oil works as a grease cutter and is also an antiseptic, anti-fungal, and antiviral. Tea tree essential oil, which you’ll find in a lot of homemade bath and beauty products is an anti-mold, disinfectant, anti-fungal, antiseptic, and antiviral. See how clean that shower and tub are going to be? Now, maybe you really love this DIY soap scum remover but would like to prevent soap scum (or at least cut down on it) altogether? I hear ya! First, you need to understand what soap scum is. Soap scum is a buildup of residue, such as oils, from your bath products including obviously, soap. Typically, soap scum is worse if you have hard water. With that in mind, one way you may be able to cut down on soap scum is by utilizing homemade bath and body products including shampoo, conditioner, and body wash, which tend to have less chemical residue. 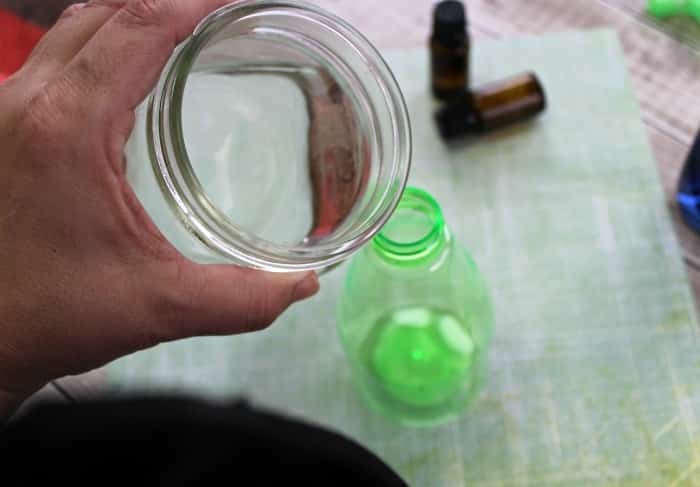 You can also cut down on the severity of soap scum by cleaning more often (including utilizing this homemade soap scum remover on a more frequent basis). I like to use a printable cleaning schedule to keep up on things. Bonus: If you want to get a really clean house, consider snagging this free printable spring cleaning checklist. So, ready to tackle that scum? 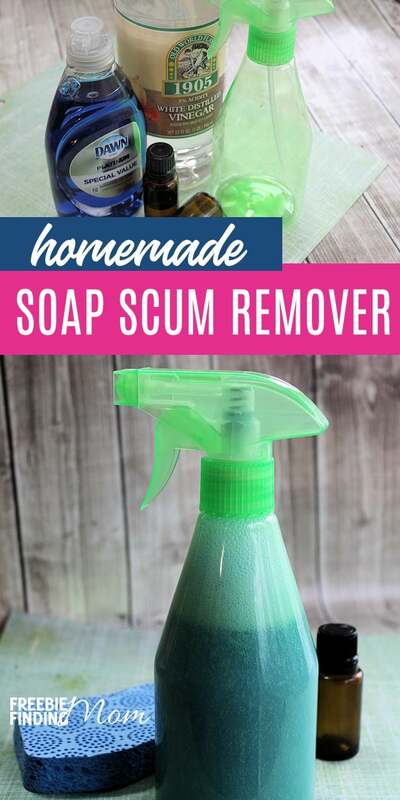 Let’s get on to the homemade soap scum remover recipe! Note: This homemade soap scum remover uses equal parts vinegar and dish soap. Tip: This DIY soap scum remover works best with warm vinegar so I typically only make enough for one shower cleaning at a time. 1. Add vinegar to a heat safe container and microwave for one minute. 2. 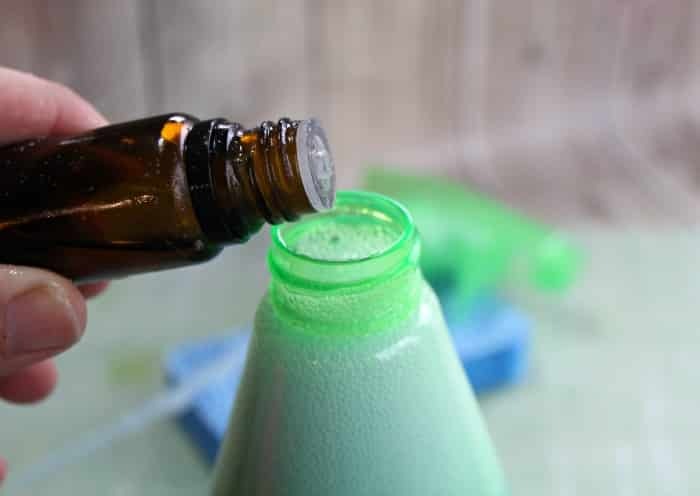 Pour vinegar and dish soap into the spray bottle, cap, and shake vigorously to combine. Tip: Use a funnel to avoid a mess! 3. Add essential oils, cap, and shake again. 1. Spray homemade soap scum remover on build up. Tip: Don’t be afraid to go heavy! 2. Let the DIY soap scum remover sit for 15 minutes. 3. Use the rough side of a sponge and a little elbow grease to scrub soap scum off. Note: If there are any extra stubborn areas, don’t be afraid to apply a second coat of homemade soap scum remover, wait another 15 minutes, and re-scrub! I love DIY and I have essential oils, I’ll have to try this. 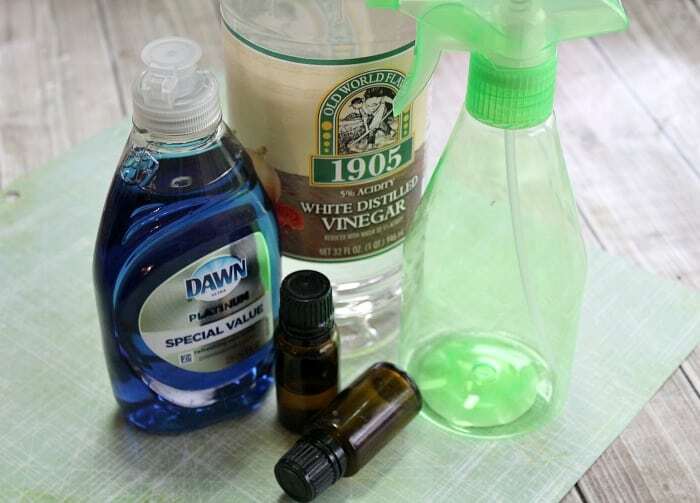 I have use this homemade cleaner for years without the essential oils and it works wonderfully!